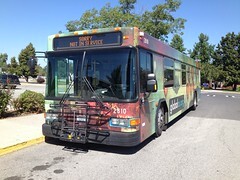 After a long wait, the ZEPS Electric Bus has finally begun rolling on the streets in the Tri-Cities. Last October, I first reported that Ben Franklin Transit would be launching an all-electric battery-powered bus built by Complete Coach Works of Riverside CA. While it was supposed to begin service last year, delays in the building of the bus (mainly waiting on the batteries to arrive from China) pushed the launch back to now. 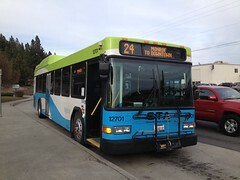 The bus has actually been in the Tri-Cities since last month, but it did not go into service immediately as BFT staff needed time to familiarize themselves with the bus, as well as clear up any potential operational problems (such as low hanging branches on the routes it is running on). As expected, the bus is very quiet. With no diesel engine or transmission to make noise, the only sound you can hear is the hum of the electric motor and the A/C unit running. When accelerating from 0mph, the bus has a bit of a rattle (imagine a bad shift on a manual transmission car). This only lasts a few seconds, and seems to be less intense when the bus operator accelerates faster. 5-25mph is about the ideal speed range for the bus. Once it gets over that range, the bus starts to become more sensitive to small bumps on the road. With the big battery box sitting on the roof, the bus ride is a bit stiffer. Going through corners, the bus has less “body roll,” but the suspension also strains a bit more in corners due to the added weight. The added weight also makes the bus sit a couple of inches lower, and along the way it did grind on the road a couple of times while passing through intersections in North Richland. Anyone who rides a Gillig Low Floor regularly is familiar with the interior rattle, but on the ZEPS Electric Bus it is fairly muted. Once the bus gets past 25mph, you do start to hear some of those rattles though. To extend the range of the bus, there is a regenerative braking system installed. The average rider won’t notice it, but a trained ear can tell when it kicks in. The transition between acceleration and regenerative braking is quite smooth, unlike the slight kick you sometimes feel on a Gillig HEV. To lighten the bus up a bit, new seating was installed. Unlike the typical fully padded seats one can find in BFT’s buses (excluding ones bought used), these are ergonomic seats made of composite material. I heard multiple operators state that they were uncomfortable, but I found them perfectly fine. The floor was also redone, with the plywood subfloor replaced by a composite with a rubber flooring on top. In the operators area, there are a couple noticeable changes. Where the transmission control normally sits, there is a large toggle switch and a yellow push button. On the right side of the dash, a 7-inch screen has been installed. On the screen, there are two gauges for the regenerative braking and the battery charge. While passing through the Stevens Center area, the bus operator exclaimed out loud that the bus had only used 25% of the charge. While it’s obviously an add-on to the usual Gillig Low Floor dashboard, it is molded in so it looks like it belongs there. 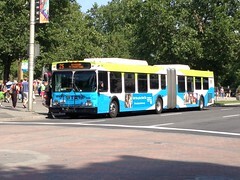 On the exterior of the bus, the most noticable change is the special livery. New LED headlights were also installed, and two overhead A/C units are on the roof of the bus (the usual A/C housing at the back of the bus was vacated for the electric drivetrain system). Overall, I had pretty high expectations for the ZEPS Electric Bus and it did not disappoint. Based on what I’ve been told by BFT officials, the bus will be going into service during peak hours only for the time being. During both peak periods, it runs on a Route 23/26 interline. In the near future, there are also plans to test it on other local routes, but it will unlikely be seen on any intercity routes. My recommendation to anyone who has the chance to take a ride on the ZEPS Electric Bus is to do so. As I’ve said before, this very well may be a small step into the future of public transportation.